This month, A Veggie Venture is inviting readers to win free cookbooks, all to celebrate the brand-new Alphabet of Veggies, the A-Z way to find great vegetable recipes. Here's how to win one of my favorite cookbooks about vegetables. After several days of hard freeze two weeks ago, I'm holding my breath that local St. Louis asparagus will be available at the Scharf booth at Soulard Market tomorrow. If they are, I'll turn to three favorite recipes for asparagus, all featured in Kitchen Parade columns. 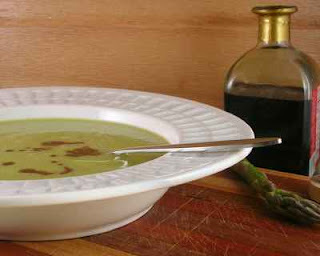 The first is a simple asparagus soup, lusty with asparagus flavor. I call it "Easy to Elegant Asparagus Soup" because it's easy, with a couple of changes, to move this from a weeknight supper soup to something smooth and elegant. 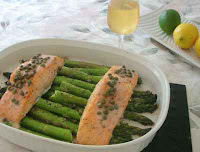 Next up is a favorite quick supper, salmon paired with asparagus, both roasted in the same dish. I can't tell you how many times I've made this, it's just so easy, so delicious, so fresh tasting. Add a salad and a dessert and all of a sudden, you're serving a feast. Plus roasting is a great way to use the fat spears of asparagus so easily and, this time of year, inexpensively. 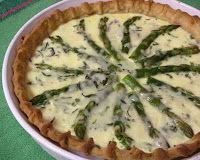 And then there's my favorite asparagus tart. With a purchased crust (or of course, your own pastry) it takes only 20 minutes to assemble and is on the table in an hour! It's light and creamy and perfect for a spring brunch or a summer supper. And what about those asparagus side dishes and salads? Oh my, yes. Just check all the asparagus recipes here in the A-Z of Veggies. SO WHAT IS KITCHEN PARADE, EXACTLY? Kitchen Parade is the food column that my Mom started writing for our family newspaper when I was a baby. It's published in my hometown newspapers in suburban St. Louis and features 'fresh seasonal recipes for every-day healthful eating and occasional indulgences'. If you like A Veggie Venture, chances are, you'll love Kitchen Parade. All recipes are thoroughly tested by a home cook in a home kitchen and many are family and reader favorites. All recipes feature easy-to-find ingredients, clear instructions and because I believe so strongly in informed food choices, nutrition analysis and Weight Watchers points. Want to know more? Explore Kitchen Parade, including Kitchen Parade's Recipe Box!